August 27, 2011: K-9 handler/owner, Lew Decker, and his wife, Velice said goodbye to K-9 Otis, after a short, heart-breaking battle with cancer. Just prior to his passing, Search Team 5-1 paid tribute to Otis and his human partner, Lew Decker, for their hard work and dedication to the Team. 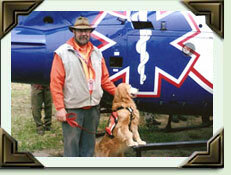 You can read the Tribute Letter to Lew and Otis using Adobe Reader or other similar program. "I joined in 2000. I noticed other teams had dogs. I had worked with my dogs doing therapy work and thought this would be the direction I wanted to go. I had no idea what I was getting into and started out blindly, slowly contacting others, and feeling my way through. I got to work with another person on the team, John Rice, who has since left the team, who had dog expierence, and I was off and running. I found Otis was best at tracking, though most Golden Retriever's on other teams were air scenters. It took 4 and half years to complete his certifcations as there were only a handful doing the tracking and one tester in the downstate area. I was fortunate enough to get hooked up with Jesse Davis, a State Trooper in the Oneida area, who worked Bloodhounds. The Federation allowed me to complete my certification testing with Jesse, and Otis was official in the summer of 2007. 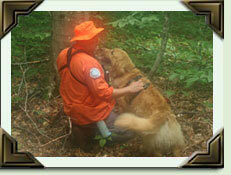 Currently he is one of only two certifed tracking dogs in the State Federation of teams, and the only Golden, so far, that is tracking. "Otis works on lead and needs a scent to work from. It can be a clothing article or even a point last seen that has not been contaminated by others. "Otis and I were called out once, two years ago, in the Benson area (our back yard) on a search for a missing person near the ski lodge. Otis didn't find him, but tracked over a mile in the dark where he was figured to have walked. The subject came out on his own the next day." December 11, 2011: K-9 Officer, Lew Decker, announced that he would be stepping down from the position as of January 1, 2012. With no currently certified K-9s on the team, the position will remain unfilled until it becomes necessary to have someone take over the position. How can my dog and I get involved? As stated in the 5-1 policies book on the K-9 section you will find that anyone interested in starting this needs to be a member of 5-1 for a year. The reason is one needs to have a good background in navigation and experience in what happens on a search before even having worked your dog. Of course, in the mean time, you could practice at training sessions or with other dog teams. We follow the NYS Federation of Search teams certifcation program in which one must meet and pass their standards to use your dog operationally. Anyone interested has to understand this is very intensive and time consuming work, putting in hundreds of hours of practice with possible years to complete. If you feel you might be up for this and understand the commitment and time needed please contact K-9 advisor, Lew Decker, for details, or contact the Federation K-9 coordinators. Search Team 5-1 does not currently have any active K-9 teams. Shelby is another Golden Retriever who is currently in training as an air scent dog. Bio coming soon.